Zoho Projects provides an option to import users and accounts from Zoho CRM. From Zoho CRM, you can now import your project and client users to your Projects portal. This feature is not available for Zoho CRM Plus and Zoho One users. Navigate to the EXTENSIONS & APIS section and click APIs. Click the Zoho Service Communication (ZSC) Key tab. If you are not an Administrator in Zoho CRM, you will not have the privilege to generate ZSC key. 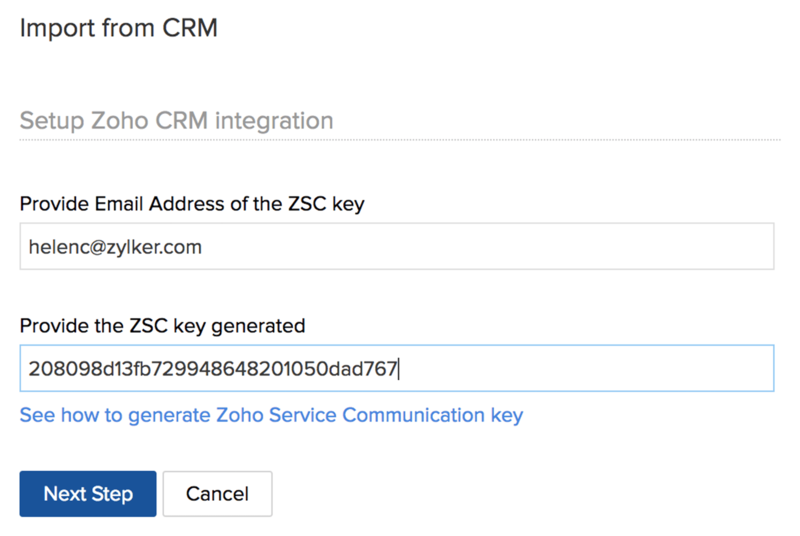 Contact your Zoho CRM administrator to generate the ZSC key. Login to Zoho Projects and click in the upper-right corner. Click in the upper-right corner and choose Import From CRM. Provide the Email address and the ZSC key generated for the CRM account. All the CRM users are displayed. Assign a User Role for every user and assign them to one or many projects. 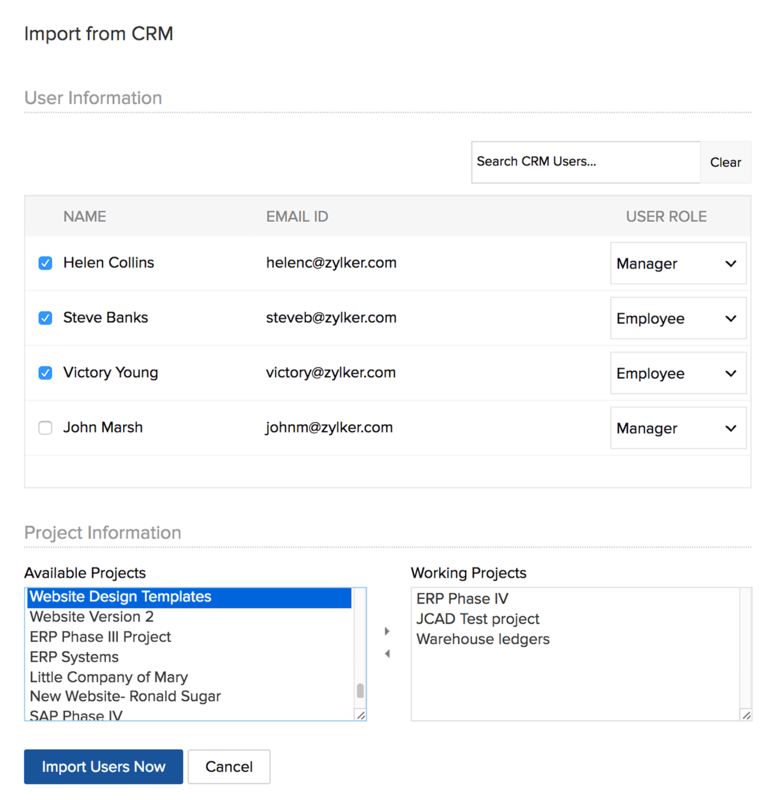 Click Import Users Now to import the users from CRM. 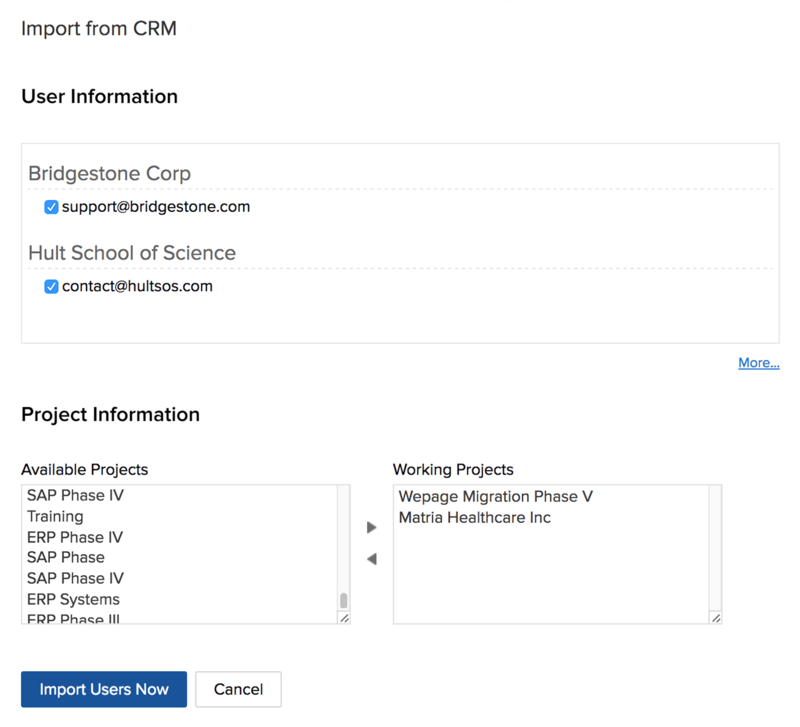 The CRM users are now added as Portal Users in Zoho Projects. Execute steps 6 and 7 from the above section and click Client Users in the left panel. Provide your Email Address and the ZSC key generated to import all the client accounts and contacts from CRM into Zoho Projects. If you have integrated Zoho Projects and Zoho CRM, you can view the CRM details such as CRM Account Information and CRM Potential Informationalong with the Client Information in Zoho Projects itself. 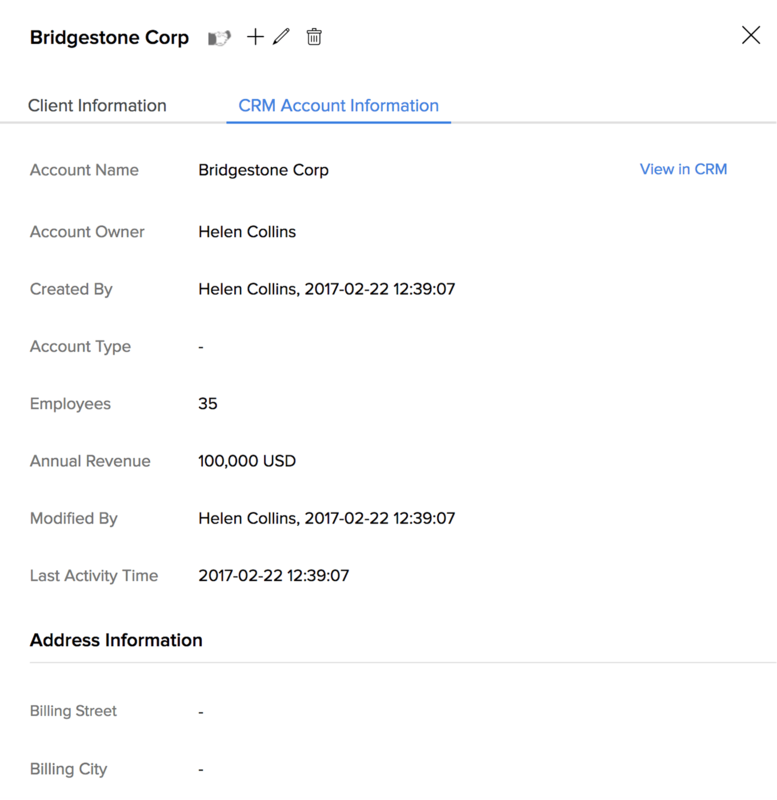 However, the CRM information can be viewed only by the portal Admin. Learn more about client users. If you wish to import users from a different CRM account, you need to generate a new ZSC key. Click Change the ZSC Ticket link, on the Right Panel to generate a new ZSC key. Provide the new email address and the corresponding ZSC key generated to import users from CRM.